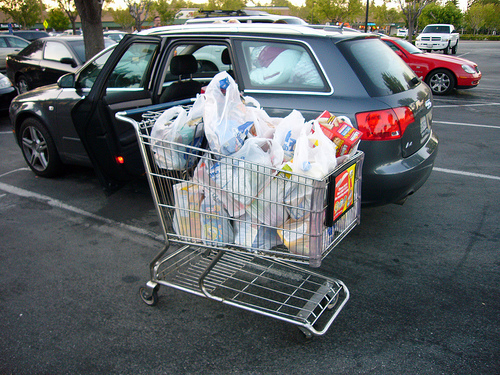 Shopping carts make us buy more stuff than we can carry home. Photo by foreverdigital. The Sydney City Council voted on Wednesday to ban trolleys (shopping carts) at a local market, citing shoppers’ propensity to load up carts with far more food than they can carry, and then rely on a car to get home. The City Council is promoting “drop-in-as-you-walk” supermarkets, starting with the new market on Erskineville Road in the west of the city. Customers are encouraged to shop with small hand-held baskets or reusable bags from home. The plan intends to discourage large purchases, which will help ensure that people walk or bike home. Banning shopping carts is one way to prevent traffic congestion around new shopping locales. What do you think? Do you know about a shopping cart ban in your neighborhood? Does it work?